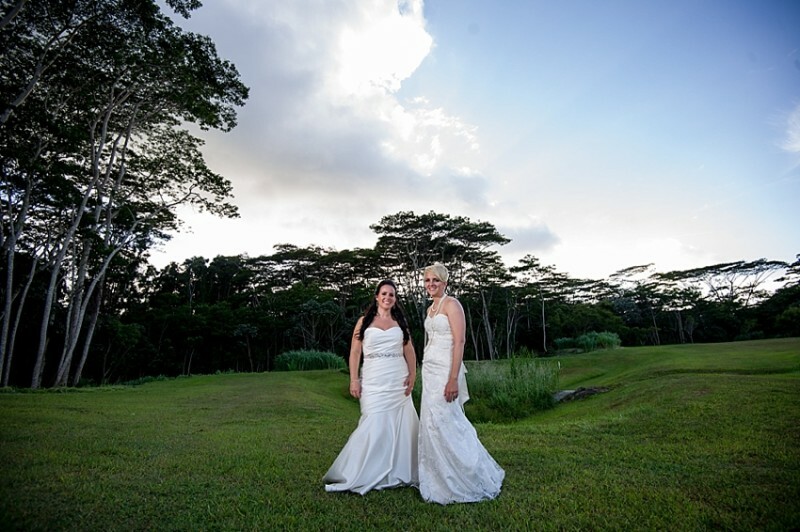 We (Robin & Renee) are excited to officially share with you some of our favorite wedding day images from our Kauai, Hawaii destination wedding captured by the one, the only, our main man Dan Dalstra of Dan Dalstra Photography. We also had our beautiful friend Courtney, from Iowa, fly out and second shoot with Dan. Basically, we had the sickest photography team around and we could not be happier with the photos that these two super stars captured! 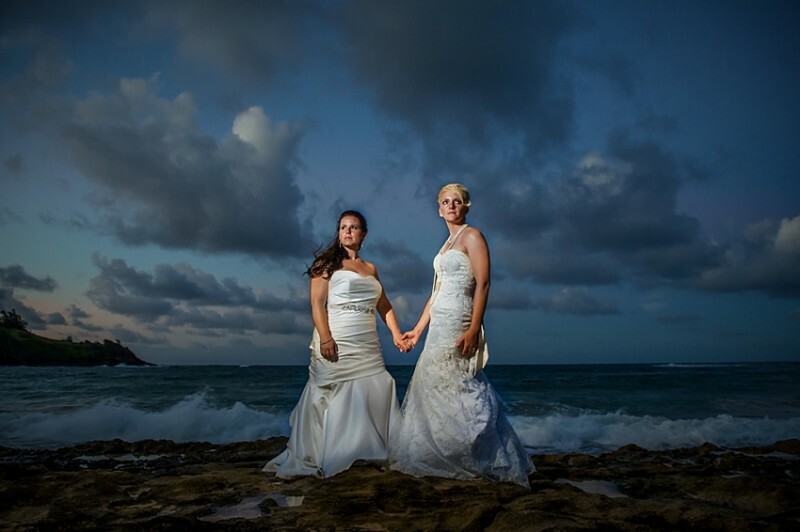 If you have been following our story you know that we were originally getting married in Laguna Beach, CA. 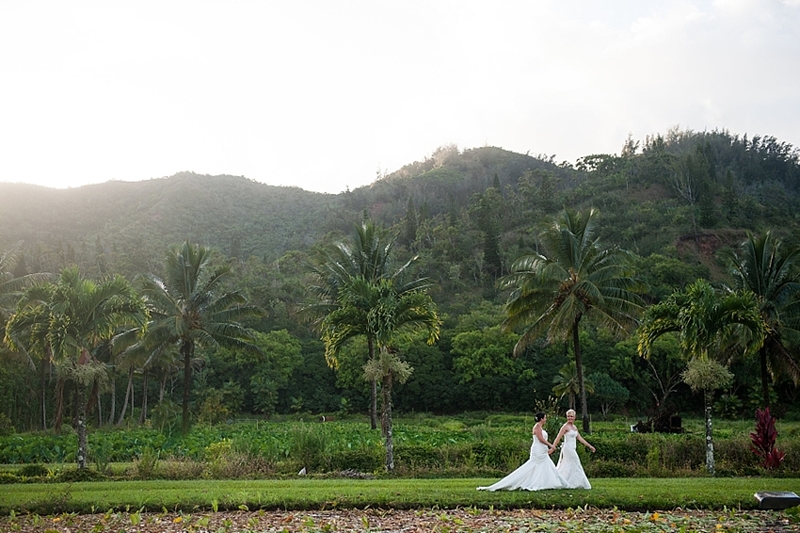 That is until we realized we were going to end up spending WAAAAAAY more than we wanted and we could spend half as much and get married in our favorite place on the planet….Kauai, HI. 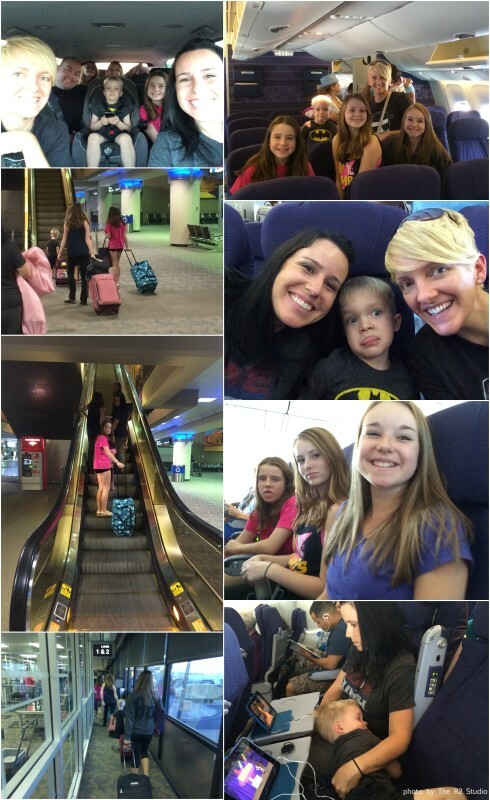 So with that our friends, family, our kids and R&R boarded the plane to paradise. 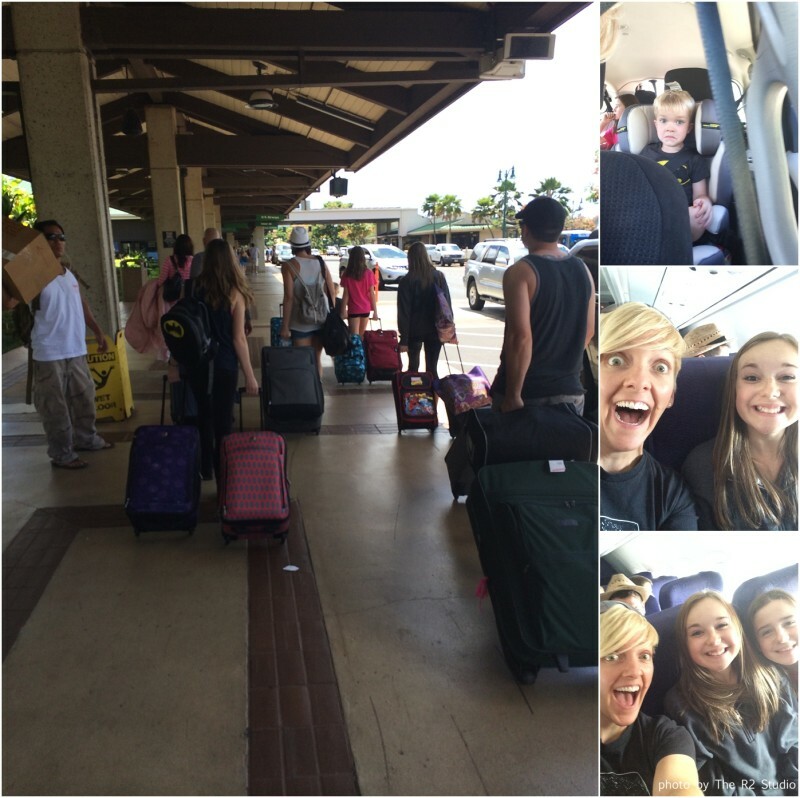 Once we arrived on Hawaiian soil everyone was SUPER excited!! The first night there all of our friends met up at the GORGEOUS house that we rented for the week and we had a huge “family” dinner. 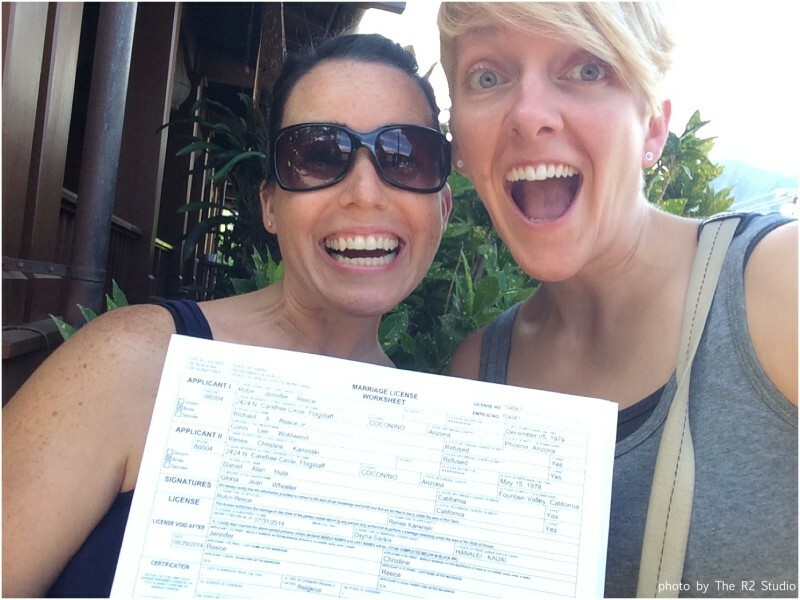 Second day on the island, we went to a hair salon (no kidding) and picked up our official marriage license. Things were getting real!! Can I just tell you how freakin’ fabulous it was to have a LEGAL marriage license? Well, the feeling was amazing and semi-surreal! We were ecstatic! 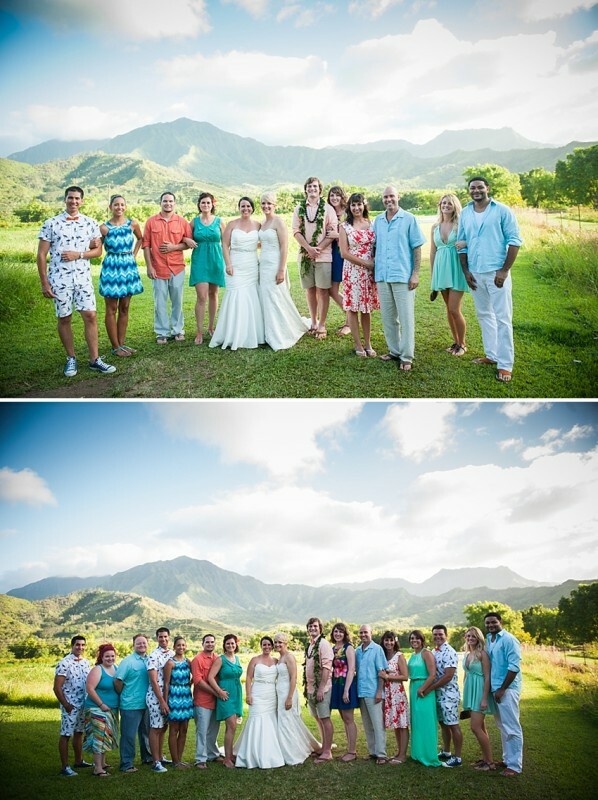 That same afternoon we all met up at Hanalei Bay for some beach action. One of our favorite places to eat was this little tiny hot dog shop called Puka Dog. They have the most amazing hot dogs on the island complete with local relishes that just make these hot dogs out of this world – amazing! Our group is STILL talking about these hot dogs. 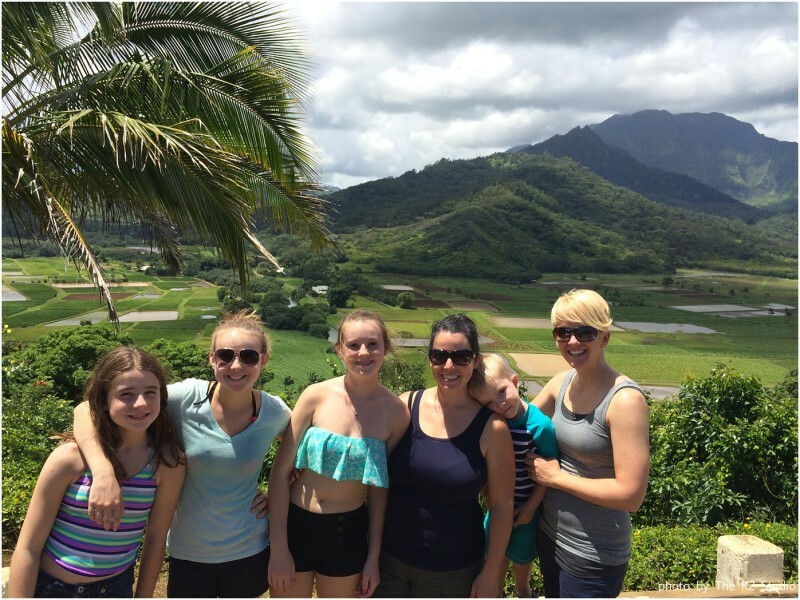 Quick family picture at the Hanalei lookout. You can see taro fields for miles. 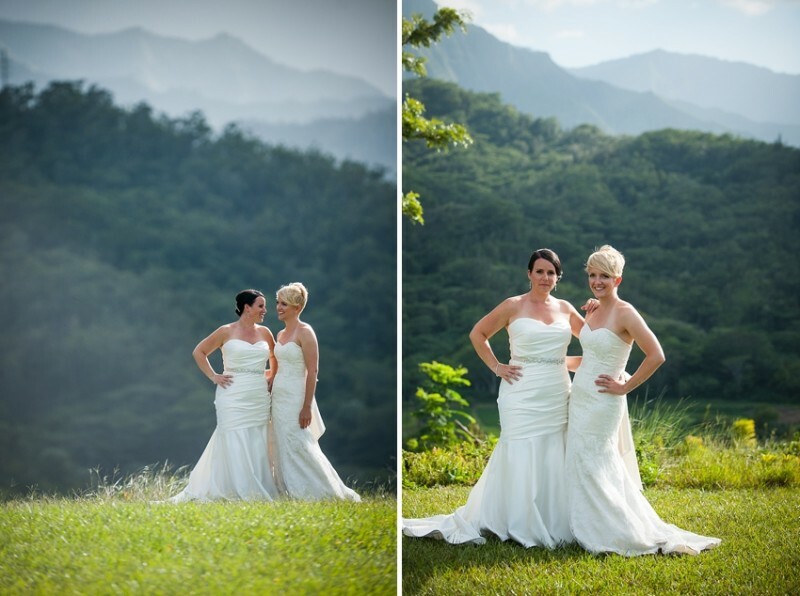 We just love the green mountains, which is one of the reasons why we ended up choosing the ceremony location that we did. Another beach day with the whole gang on Moloa’a Bay. 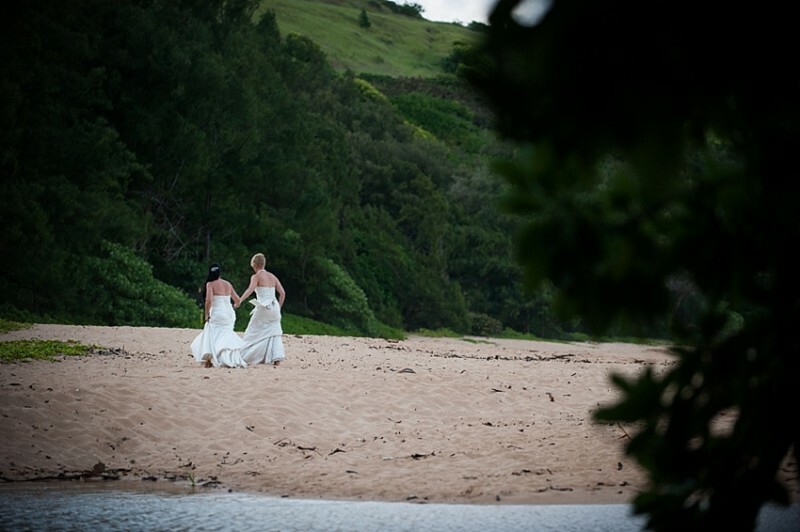 This is our favorite beach on the island and quickly became a favorite of our group as well. Great boogie boarding and snorkeling with lots of shady beach options for those of us who just wanted to lounge around. The snorkeling left a lasting impression. We took a helicopter ride with our super rad (basically the MOST rad) videographers to the Jurassic Falls (the waterfall from the movie Jurassic Park). It was incredible! 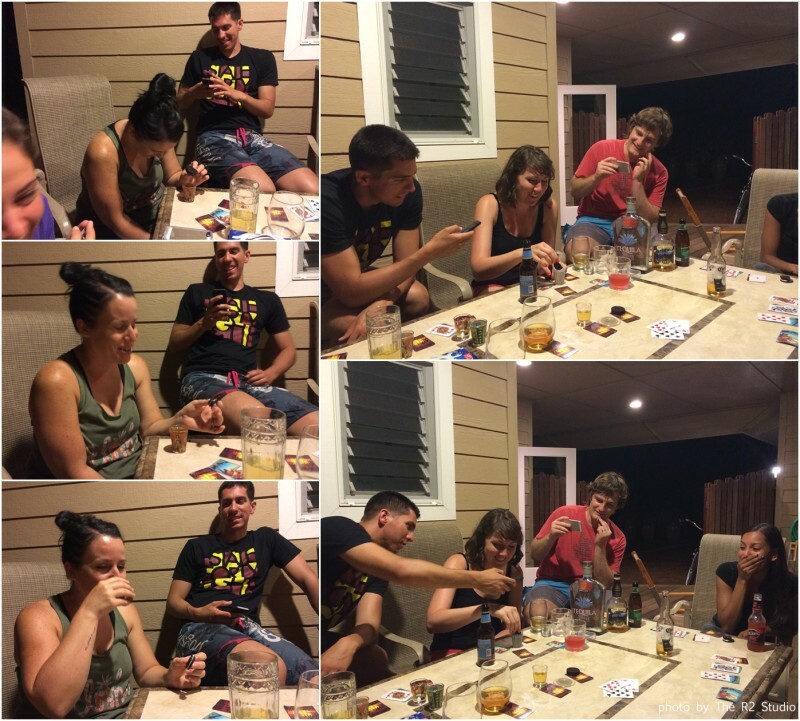 There were several drinking games that happened along the way. This one, in particular, was complimented with the option of choosing the “Oreo Dunker” as your shot of choice. Renee just looooooved it, as you can tell. Back at Hanalei Bay, some of our group was able to participate in some surfing lessons. Ava would fit right in with the locals. While some were surfing, others were working on their best (or worst) dance moves. Lots of beach days. The sun really took a toll on Alexa and Renee – Nap Time! The day before our wedding, 18 people from our group participated in a float down the sugar cane canals. It was, hands down, the most amazing thing that we did during our trip. 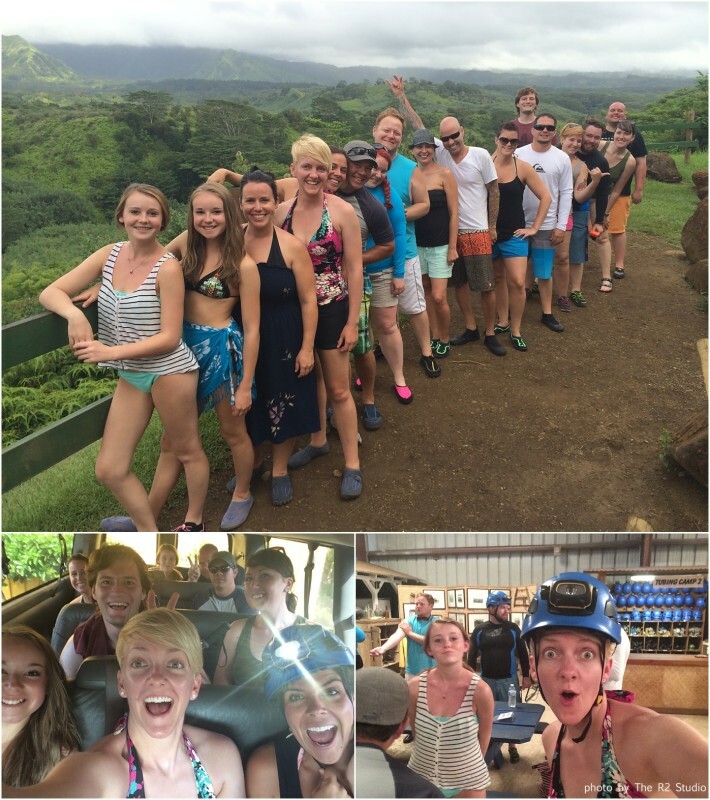 Floating down a canal with head lamps on with 18 of your most favorite people in the world – priceless. 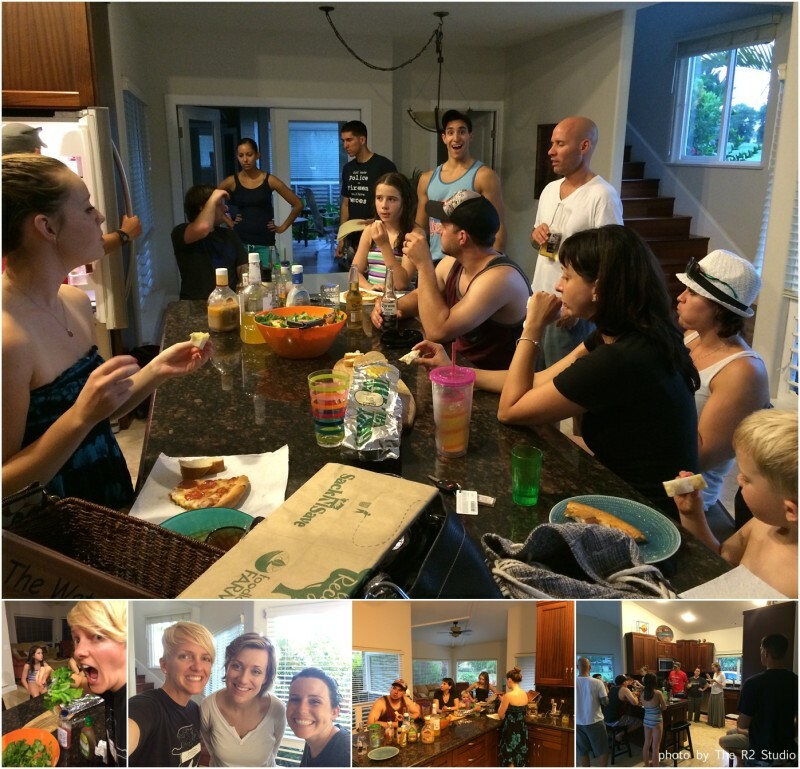 We had a HUGE pool party as part of our “rehearsal” night. So, basically, if you haven’t picked up on it yet, we decided to have a week long party with our guests leading up to our wedding day. This included renting multiple houses all within a block of each other. 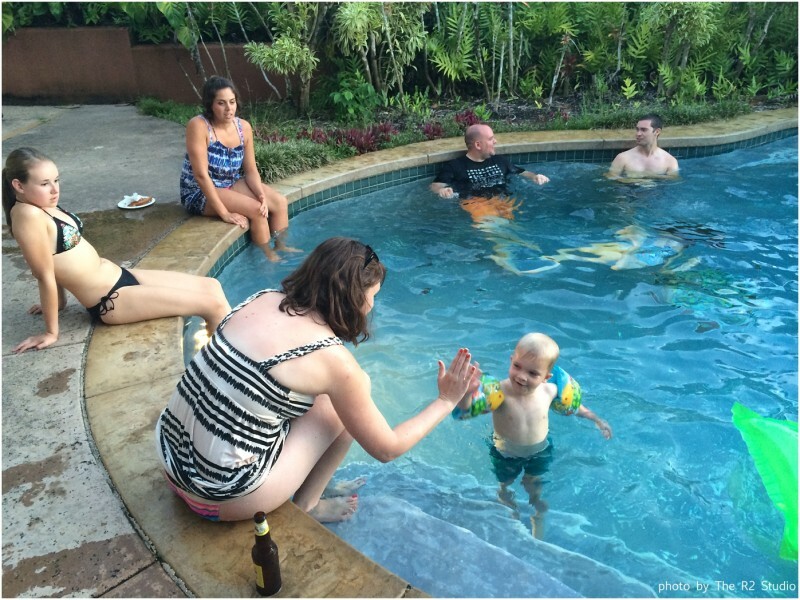 We lived it up throwing pool parties, having beach days, drinking, BBQ’ing and just enjoying our time in Kauai with the people we love. This is one of our favorite images from all our trip. We headed off to our “rehearsal” and brought the kids along so they could practice their part for the ceremony. 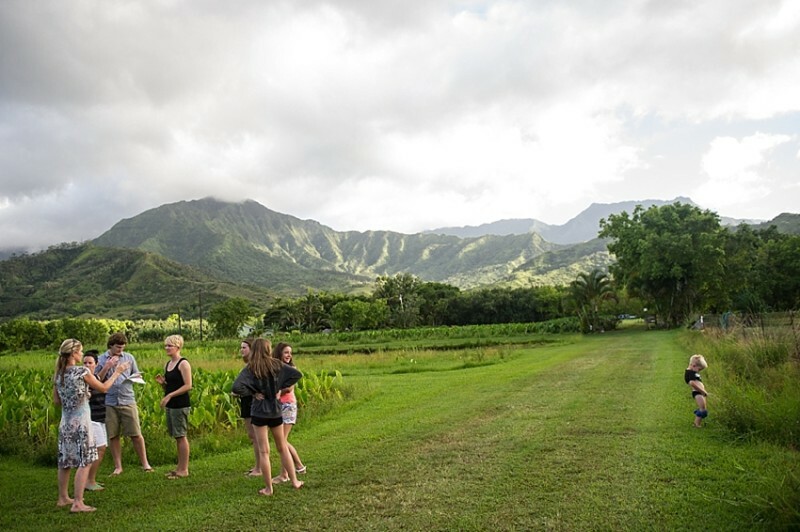 While we were talking to our wedding planner Veronika, of Alii Kauai Weddings, we noticed Austin peeing in the taro field. Dan captured this candid moment so perfectly. If you look at this image you will notice that Robin nor I knew Aussie was doing this. Wedding day! 8.4.14. The best day of our life! Well besides having our beautiful children. 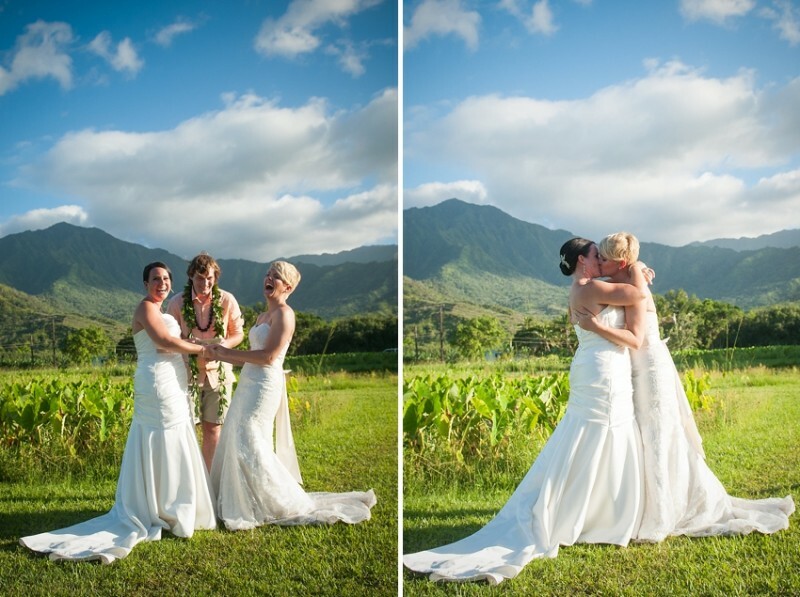 Hawaii is an LGBT friendly island and about a month before we left they passed Marriage equality in their state. So our marriage is legal! WOOHOO! I, Robin, am not sure what better view you could ask for while getting your makeup done. 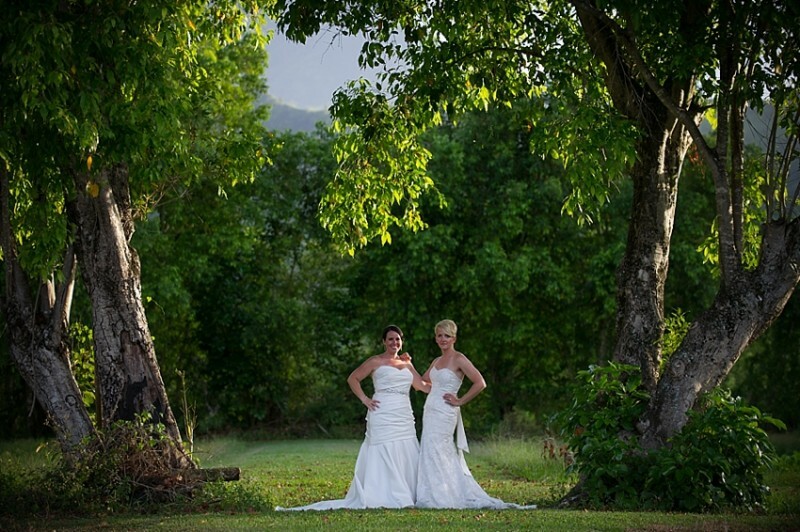 We were “those” brides and requested an image of our dresses hanging up together. 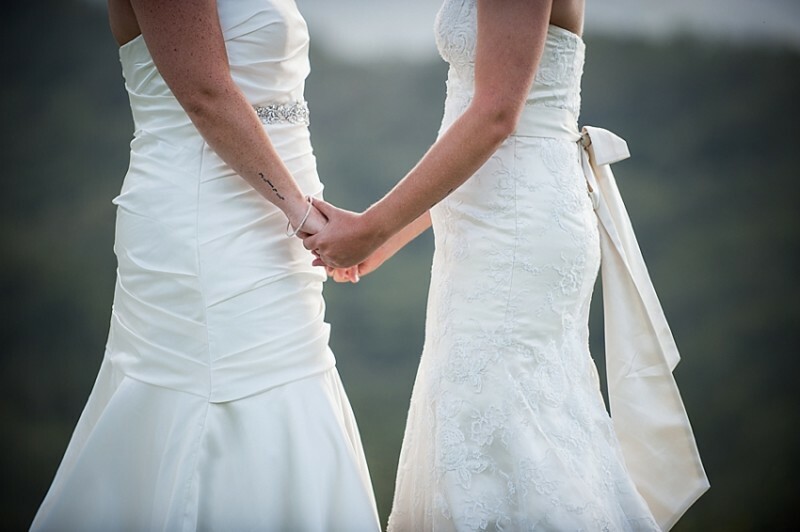 There is something so special and un-traditional about this dress shot. We are kind of crushing on it. And the shoes?!? Robin is in love with those shots too. I think her shoes on the lily pad is one of her favorite photos in all our gallery. Robin’s family was not supportive of our wedding so we did not invite them. However, her grandma, who passed recently was remembered in this letter and charm I gave to her on our special day. We believe she would have been the one to show up and offer her unconditional love and support. It was also my goal to make her cry at least once! 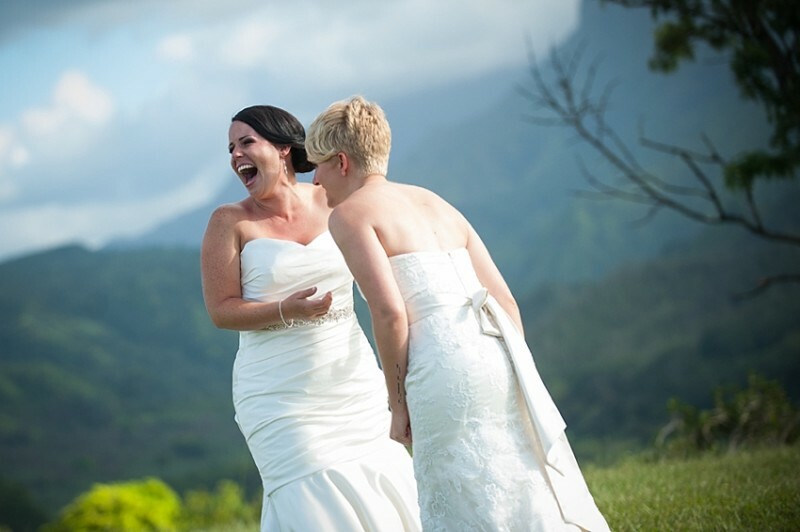 I achieved it during this moment on our Kauai wedding day! 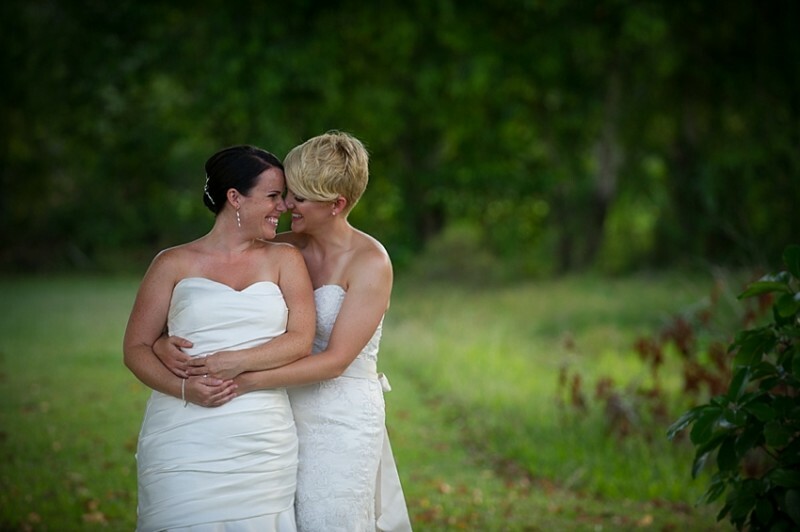 One of our bestest friends on the entire planet, Sarah, was an integral part of our wedding day. She went with both of us to find our dresses, helped us plan parts of our wedding and was there the entire day for us. She calmed our nerves, made us a goody bag, and gave us her support! We LOVE her! 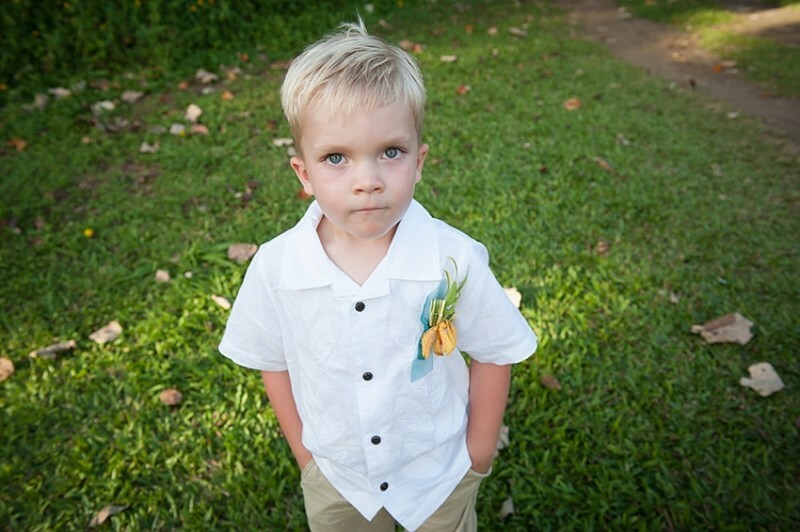 I love these getting ready images that included our kids & my mom (Renee’s). Such a special moment. The first look! You all know how Pro-1st look we are. And yes, we did one too. Before this point I, Robin, had a major panic attack and just needed to see Renee. It didn’t help that everyone left me in a hot, stuffy room alone. We scoped out a spot the day before with our photographers and found this private piece of land. Yes, we trespassed. Even me (Renee) but it was 100% worth it. 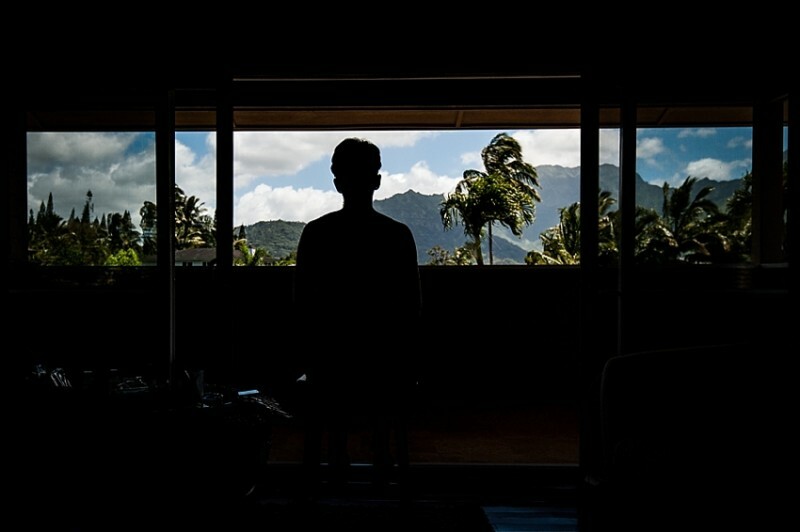 This amazing land overlooked Hanalei Bay, the mountains and the taro fields. We traveled to the spot separately and I, Robin, love this photo that Dan snapped of me looking out at the bay waiting for Renee to arrive (and taking lots of deep breaths – now I know what all of you brides go through. The emotions are CRAZY!) They set us up and the rest you will see in the images below. 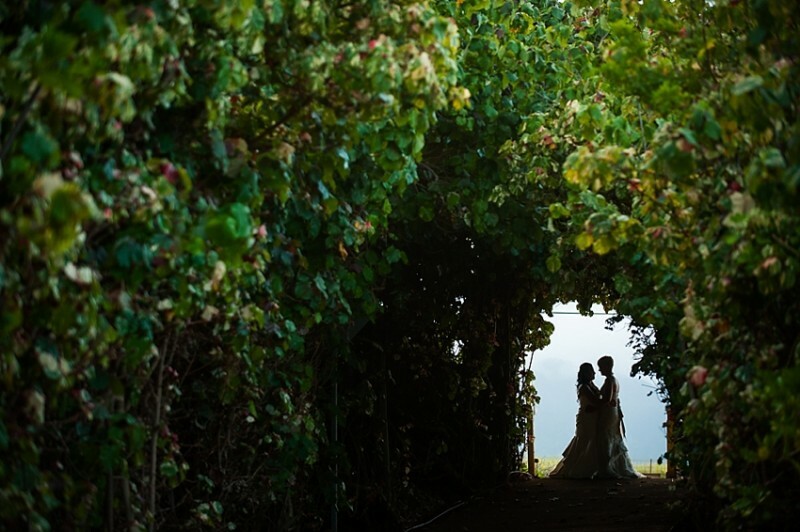 This view is so freakin’ amazing that we just can’t get enough of these photos! 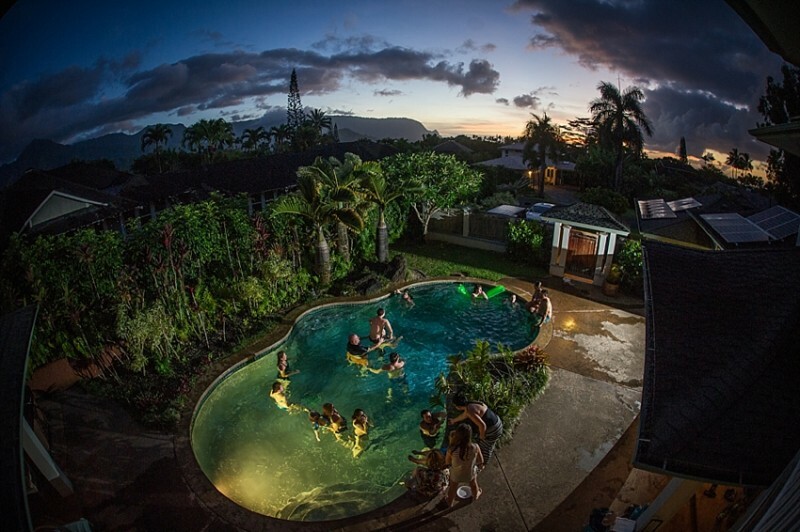 THIS is why we chose Hawaii. We headed back down to another piece of private land our planner found for us. If you know us well, you know we are not traditional people. 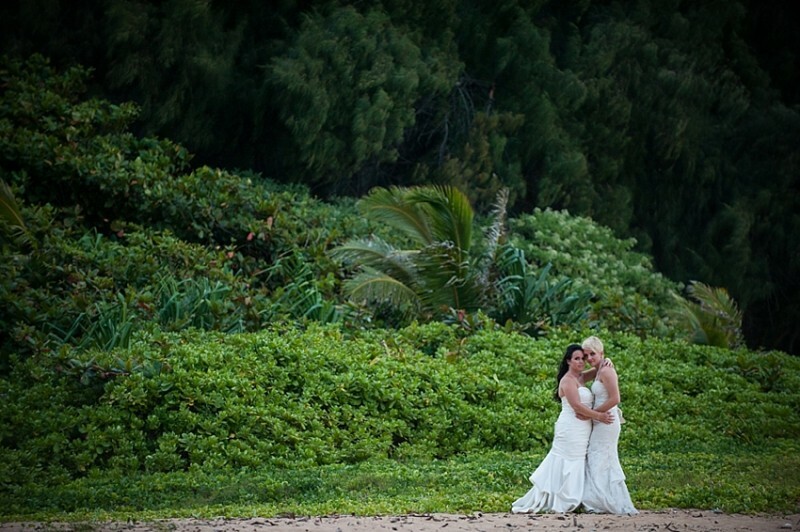 So, getting married on a Hawaiian beach was not even an option for us. 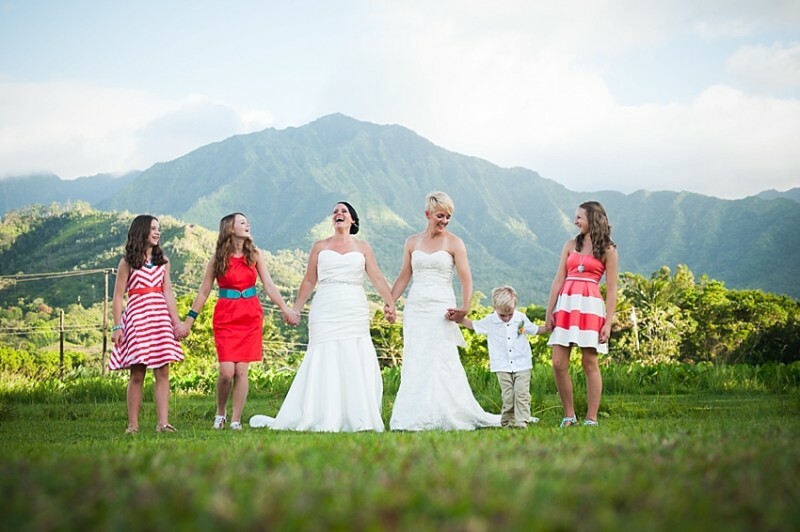 Instead we wanted the culture of Hawaii integrated into our wedding. 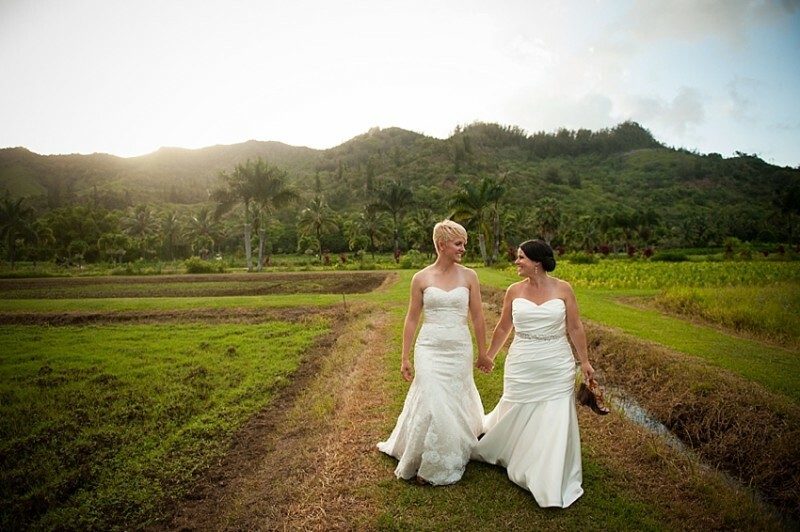 We wanted to be married in the middle of the taro fields. The Taro plant is the biggest crop on Kauai. 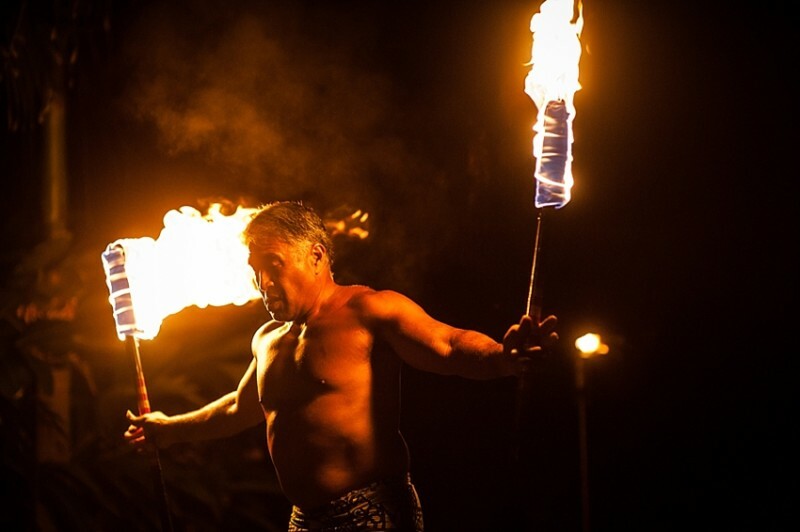 It is an important part of the Hawaiian culture. Does it taste good, no. But who cares. 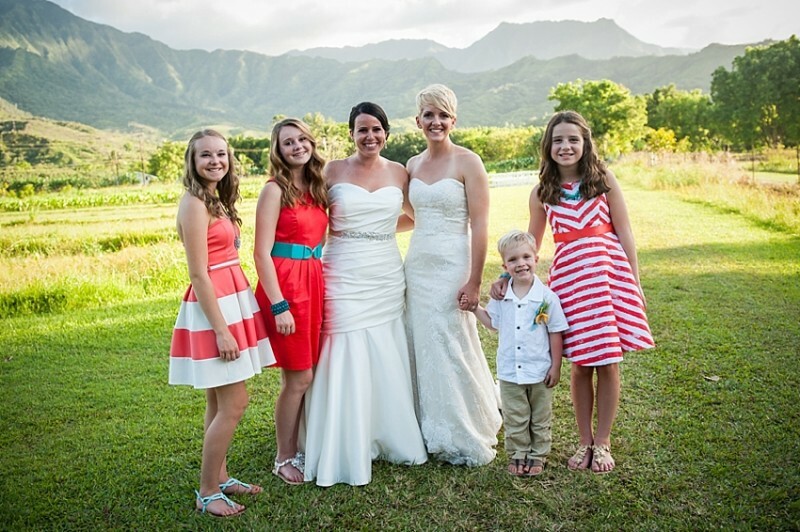 We had our kids be our “wedding party”. Austin walked both his mommies down the aisle together and the rest is history. There is a tradition is Hawaiian weddings where you take a Ti leaf, a Koa wood bowl and ocean water and wash the wedding rings. Koa is a treasured and valuable hardwood that represents integrity and strength, which are foundational qualities of a marriage. The Ti leaf represents prosperity, health and blessing of body, mind and spirit. 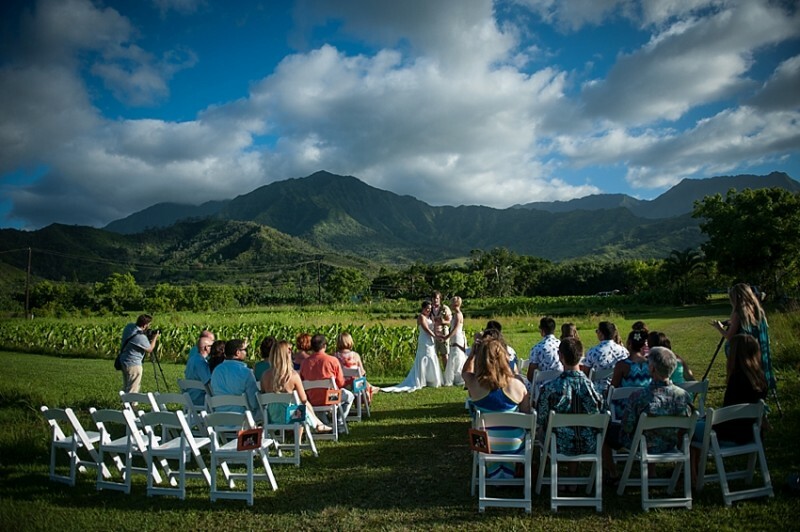 The officiant begins by dipping a Koa wood bowl into a body of water. The leaf is dipped into the bowl, and the water washes the rings. The water signifies two things: First, washing back into the ocean, symbolically, any hindrance to your relationship. 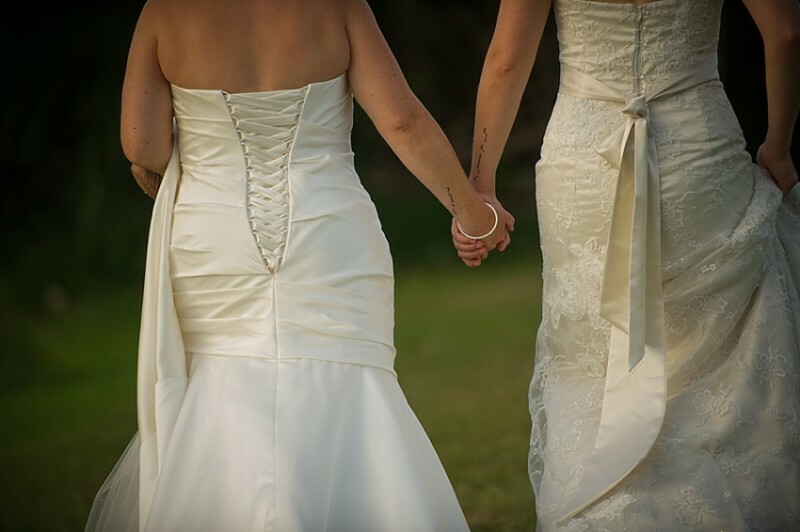 Secondly, it represents a brand new beginning as a married couple. We did it! We are married!!! 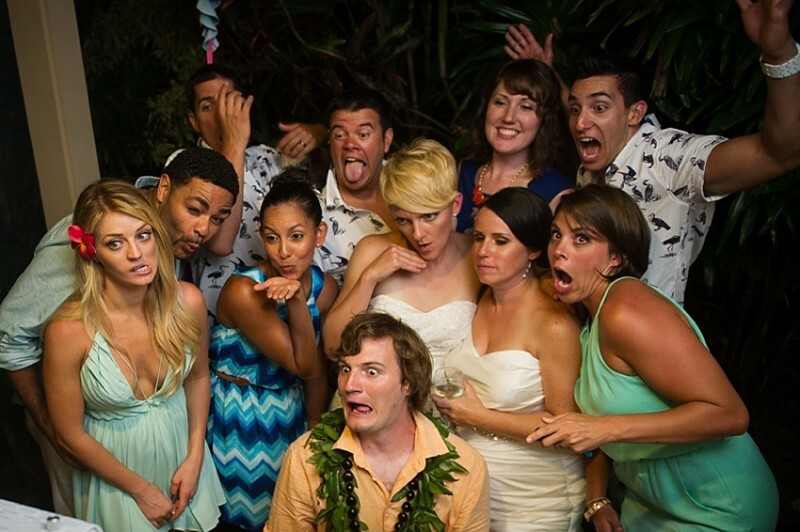 Above are our beautiful friends that made the journey all the way over to Hawaii to celebrate with us. 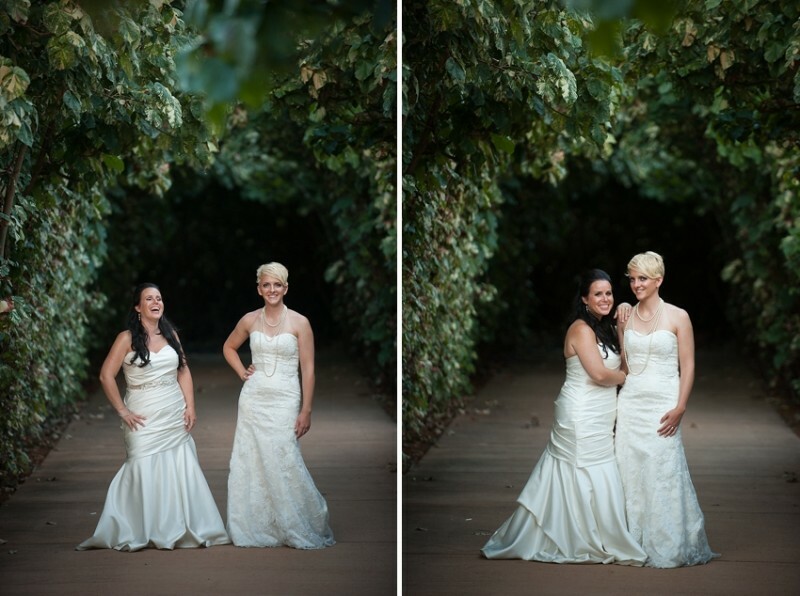 The top image is our past R2 couples whom we shot their weddings. They have all become our most special friends. We love them all and have become amazing friends with them all! The bottom pic is all our friends who came. Our team photogs Liz (her hubby) and Mykie and our friend Lenea (& Jason) who did our make-up. Our officiant Matt, was actually one of our first R2 couples. He and Sarah have become very special to us. So much so we asked them to be a big part of our day. He got ordained via the internet and made it official! He did an amazing job!! My family loves me so much! They came over to celebrate our special day with us. Above left is my mom and sisters. To the right is Brent’s family. Austin’s amazing baby daddy. His parents and siblings. Look at all this love! And of course our complete and beautiful family! Our kids are the best and cutest I must add. 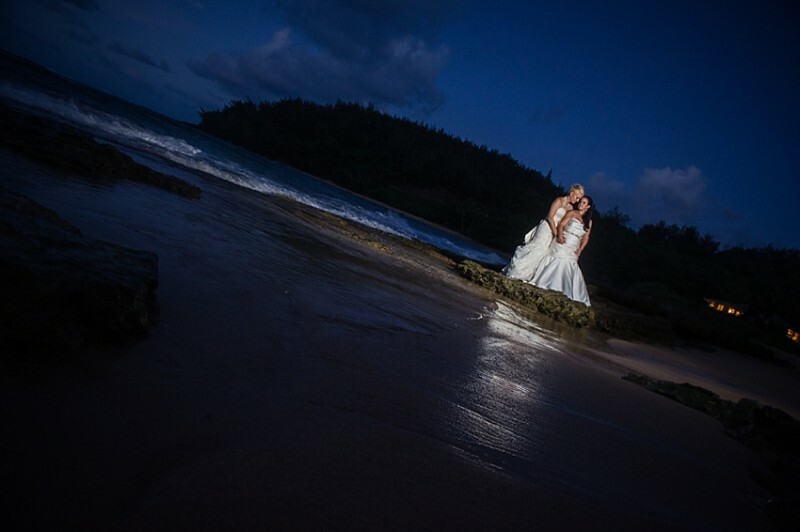 The next set of images is why we chose to get married in Hawaii. ‘Nuff said. Enjoy. 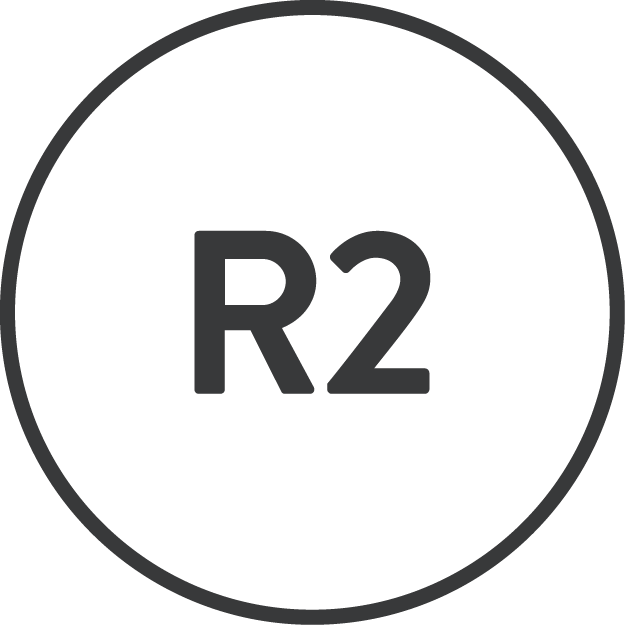 Love our little “R2A4” tattoos in this photo. That wasn’t planned but I love that you can see them and the the significance behind the meaning and the joining of our families. Party time! We wanted a low-key reception. 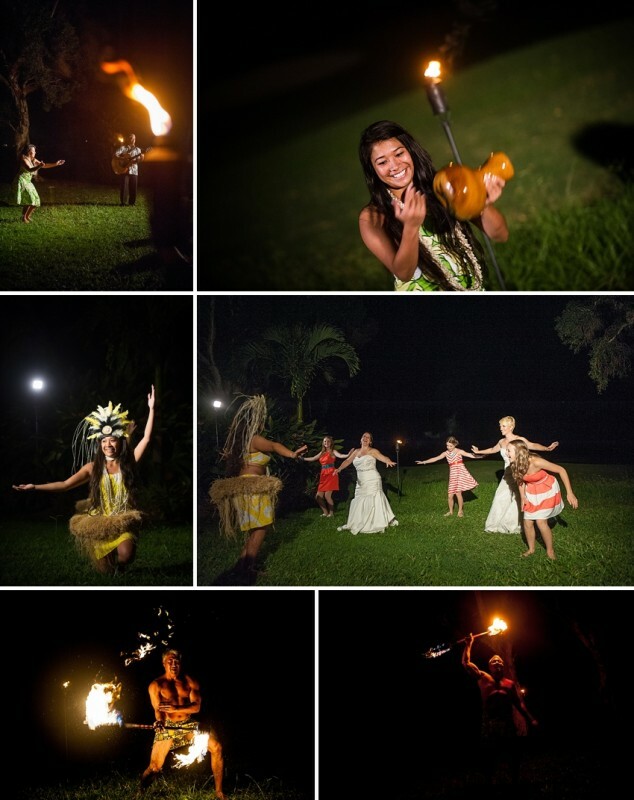 We had a chef come in and we did a BBQ Hawaiian style and had our own private Luau. Check out the SICK details that one of our other bestest friends, Brittany, hand made for us. 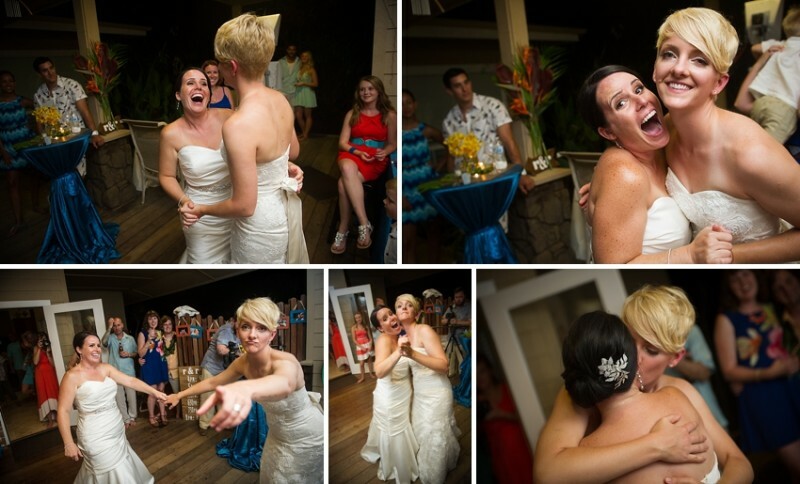 Without her, our wedding would look really boring and there would be no detail pictures. She packed an entire suitcase full of stuff and brought it all the way across the ocean… for us! She is amazing! 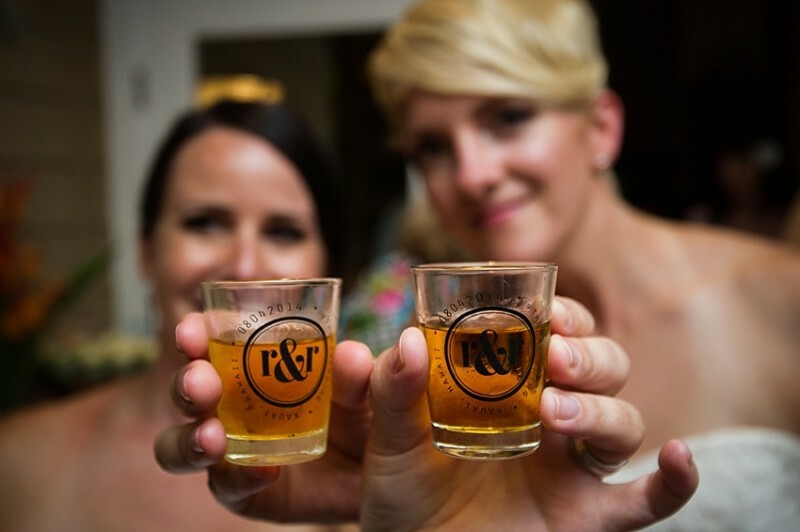 Our “toasts” consisted of a shot of Fireball in our shot glass gifts to our guests. Yum! 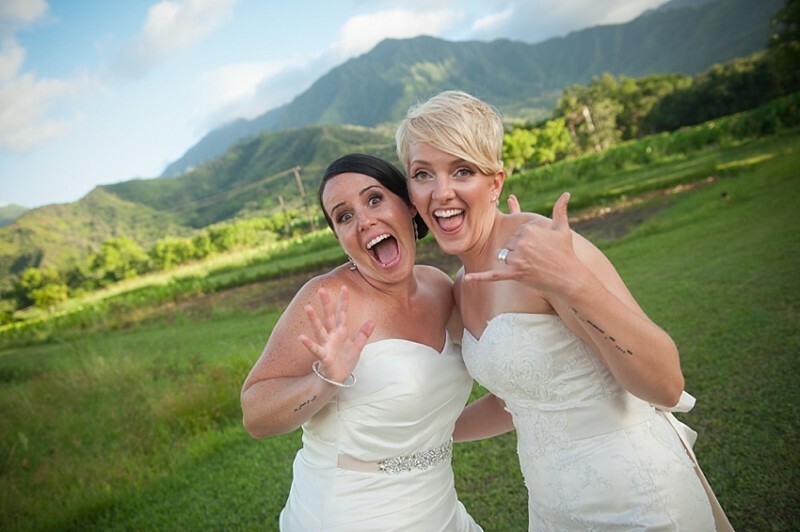 You know Hawaii is our favorite. In fact this was our 4th time going there. 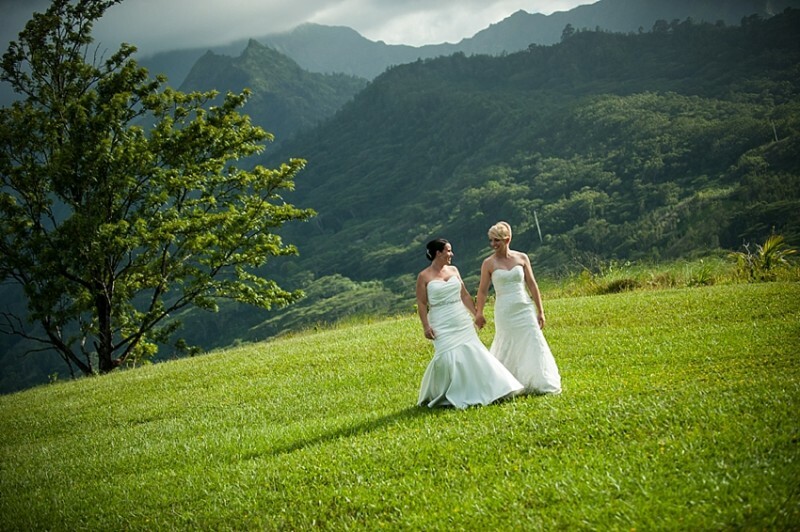 Above are images we have taken each time we were on Kauai. 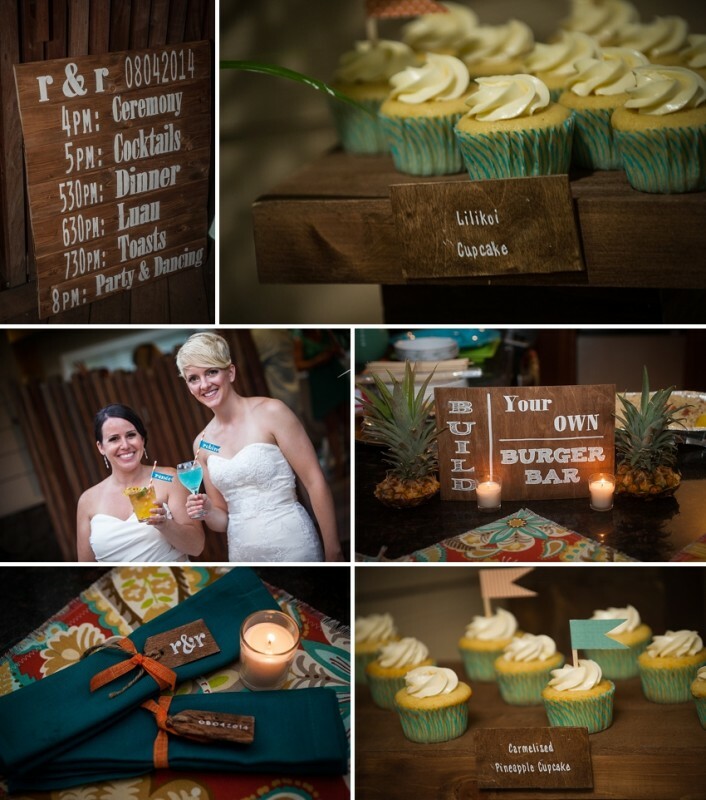 We walked down the aisle with these memories lining the walk and then re-used them for our reception. Here come the crazy drunks! Courtney brought her photobooth, which she has so thoughtfully named, Lola, all the way from Iowa. 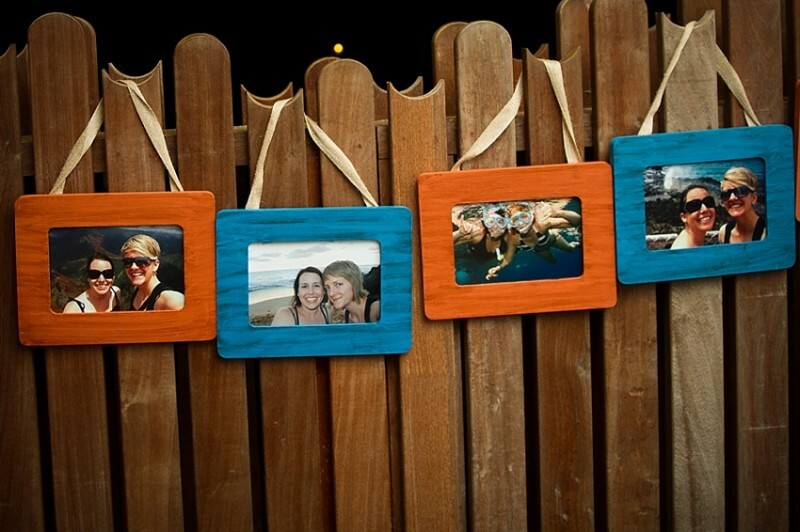 Made for some fantastic and silly memories with all of our peeps. 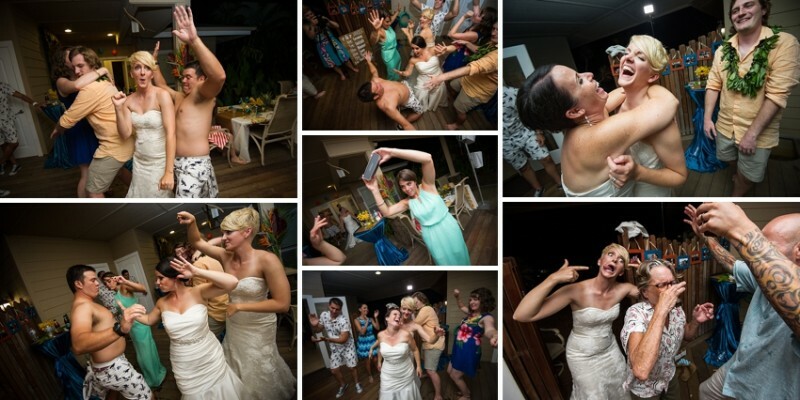 Dance party! 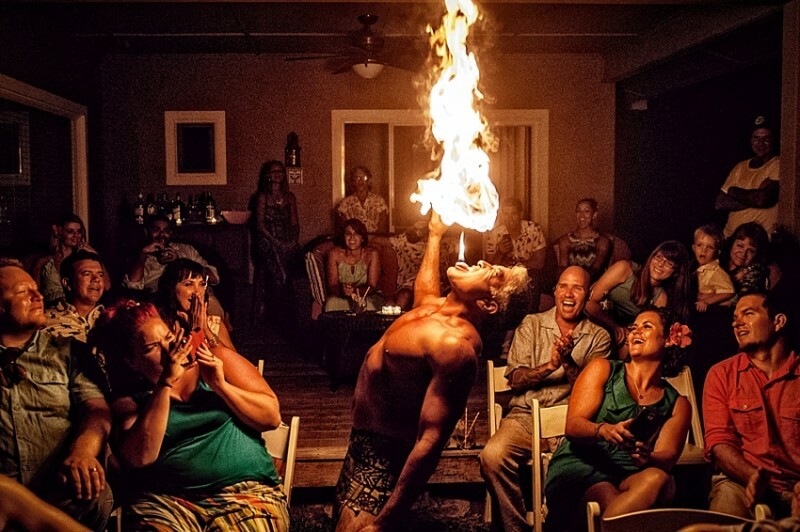 Complete with DJ Liz, shirtless Caleb, and crazy Marsha who was our house cleaner (bottom right), hired to clean up the party but instead drank our alcohol and blew her conch shell repeatedly and got our party shut down early. She is crazy!!! We did our own Vogue session on the island. Of course! Would you expect less? Here are those images. And, that’s a wrap! 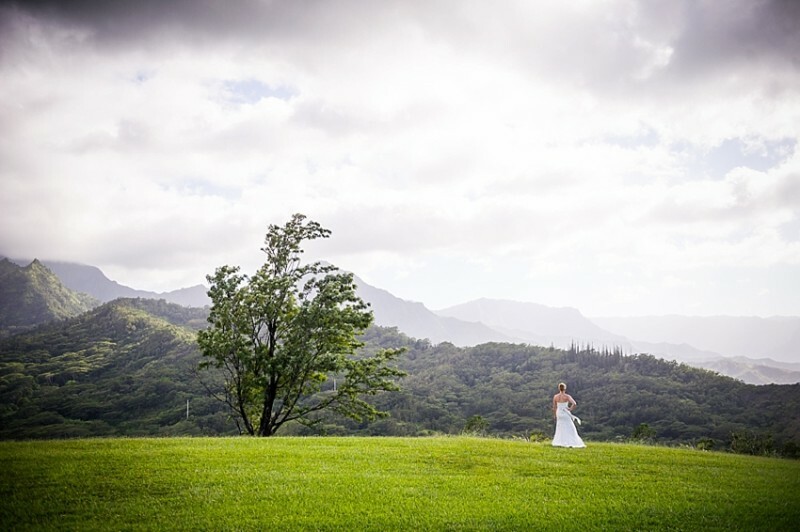 If there is any remaining question as to whether or not you should get married in a destination such as Hawaii, let me break down some of the advantages that we experienced as wedding photographers…. 6. it’s basically AMAZING. Just do it! 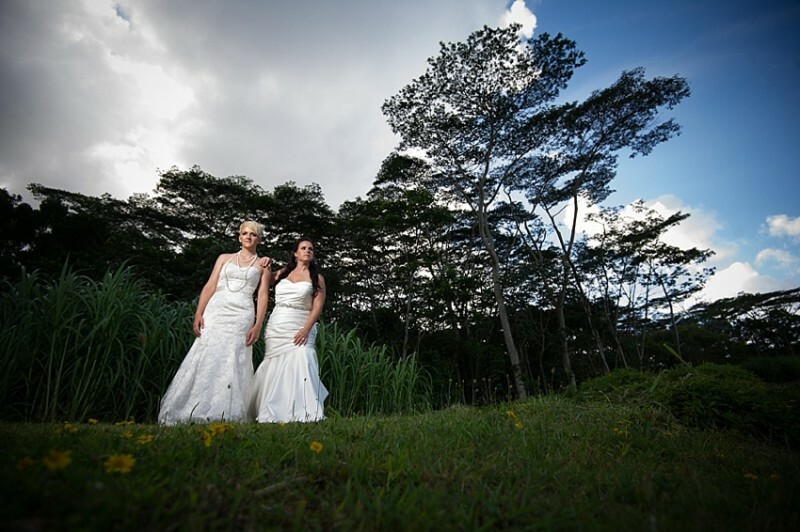 Coming Soon: #theR2wedding from The Adventures Of /Jakfoto Films on Vimeo. 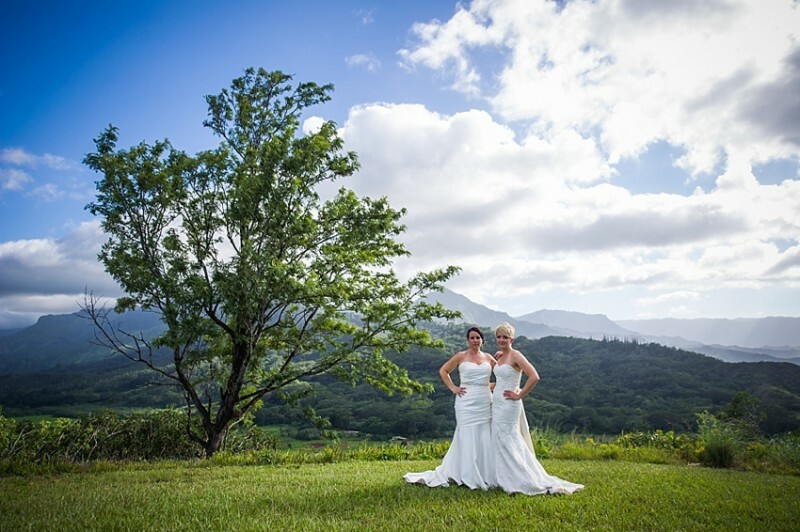 Thanks for taking the time to read all about our Kauai wedding. We hope you enjoyed the virtual wedding experience. 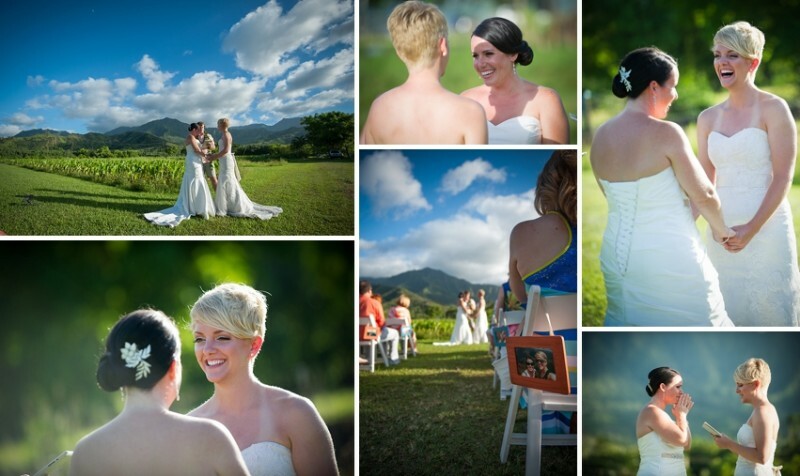 LOVED reading this and I love the pictures but I love that you were able to get legally married the most! I can’t wait until you can make it Arizona official!